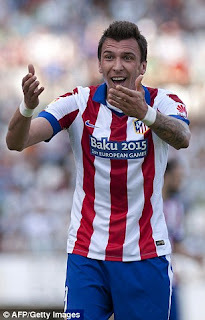 Manchester United have been offered Mario Mandzukic from Atletico Madrid. The fiery Croatian is leaving Atletico this summer and has interest from clubs across Europe but is keen to play in the Premier League. Mandzukic was a target for previous United manager David Moyes while playing for Bayern Munich and has pondered a return to the Bundesliga where Wolfsburg have also courted him. The 29-year-old started his Atletico career well as he replaced Diego Costa and returned 20 goals by February. However, there has been talk of fall-outs with coaching staff and he failed to score since February 21 in a 3-0 win over lowly Almeria. United considered Mandzukic last summer prior to his move to Spain, Arsenal were also keen while Manchester City have checked on his form earlier in the season. Manchester United are looking for a new striker after they opted not to buy Colombia's Radamel Falcao following his loan spell at Old Trafford.